Within these notes to her daughter Vesna's voice has struck an eloquent chord, resonating with a gentle instruction on all things important in life while lighting a fire within all readers to "carpe diem!" (seize the day! ); to live with self-conviction, joy, exuberance, passion, a responsibility to attain one's potential, and to reflect in oneself the best of humanity ... and to live with a mission to find an uncommon happiness at every turn of the fantastic personal journey that awaits. At the beginning, Vesna says, "...and without our daughters, a certain love story would never have been told." - and at the end she assures us this story is not over, she says, "...you are my rainbow to keep. My eyes will always be watching you, never will I lose sight of you." Has someone enriched your life in a profound way? Submit your "hero" story now! It may be included in Vesna Bailey’s next book: NOTES TO MY HERO. I am so excited about this next book. Undoubtedly, it will be beautiful and inspiring in an extraordinary way. 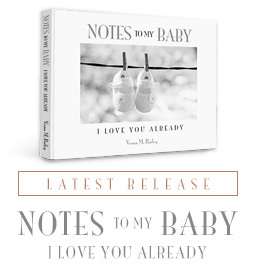 The look and feel of the book will be very much like the Notes Before You Go series, Notes To My Son, and Notes To My Daughter. Has there been someone in you life who you consider to be "your hero"? Heroes can come in big or little packages. Sometimes we are aware of their heroism in the present, and sometimes we don't realize that they were our hero until many years later. There is no definition of a hero, except that it's someone who has made a profound, positive difference in our lives, their spirit and energy has been a lasting, positive life force for us. It would be a true honour and privilege for me to share the legacy of a Hero in your life with the world at large... and what a way for you to pay homage to your hero! Inspiration breathes in words of a heart's purpose. Use the Contact Us page on the NotesBeforeYouGo website. Put "Notes To My Hero Submission" in the Subject line. The length of the submission can range from just a few sentences to approximately 300 words. The submission should include a brief backstory, and then words you would say to your hero, telling them why they are your hero or why they have had such a profound positive impact on your life. This part should be in first person, i.e. use the words "I" and "you" and not "he, she". If your submission is chosen for print, you can request that your name be printed with the submission or you can choose to remain Anonymous. Let us know if you would like to remain Anonymous. If we need to modify your submission in any way, we will contact you first in order to get your permission. If we choose your submission for print we will contact you to inform you. Please know that books can take anywhere from 1 to 2 years before they come out in print. Should you have any questions or concerns whatsoever, please feel contact me on the Contact Us page! Please understand, that by you making a Submission on the Contact Us page you are giving Vesna M. Bailey permission to print your submission in the book title, NOTES TO MY HERO. I am deeply grateful for the privilege to read your Note to your hero. Thank-you for making your submission on the Contact Us page.